Guest Post!! !~ Oreo.. Oreo.. How tasty art though, Oreo? Today a new guest poster joins NerdLush, Madame Laura! In her own words- “I worked for several years at an environmental laboratory but am currently a stay-at-home mom of 2. My all-time favorite geeky TV series are the X-Files and anything Star Trek from TNG onward. I am a long-time World of Warcraft player and have made many awesome friends through the game, and enjoy other Blizzard games as well. And my very favorite Nintendo character is Yoshi.” Welcome, Laura! So, a confession.. I’ve developed a weird thing. A thing about OREOS. Oreo has come up with tons of limited-edition flavors over time, and I am apparently their target audience.. I see a new package, and I have to buy it. Those marketing people know how to get me, and these special flavors seem to be popping onto store shelves more and more frequently in recent months. My friends have noticed this phenomenon through my numerous Facebook pictures and posts, and I have been requested to share my opinions of these oddities. I am going to go one geeky step further for NerdLush, and make recommendations on which of my favorite tabletop games would be the best side dish to accompany each unique flavor. Candy Corn Oreos: I honestly can’t recall if I actually tried these. I bought them at some point for my husband, though, who LOOOOVES candy corn, and I do NOT love candy corn. I’m guessing they’re gross. I may have actually repressed the memory of trying them. Game recommendation: Something INCREDIBLY SHORT. I’m thinking.. get an Uno game going and end it when someone plays a Wild for the first time. That way you don’t have to eat more than one. Limeade Oreos: These weren’t very good, the flavor was quite fake and strong. They were reminiscent of lemon cookies but a bit more odd. The color was an amazing bright green, though! Very pretty! Game recommendation: King of Tokyo. The beautiful green dice that come with this game would coordinate fabulously with the green of the Oreo filling. Also, you get to be monsters and smash your friends, need I say more? Reese’s Peanut Butter Cup Oreos: Okay, now we’re talking. How can that go wrong? I wasn’t disappointed, these were a delicious blend of Reese’s peanut butter (the ONLY peanut butter that matters) and tons of chocolate. Definitely one of the better flavors; it’s a keeper. Game recommendation: Cards Against Humanity. This flavor is the biggest, blackest Oreo flavor, after all; it seems like an obvious choice to me. Also, you can play that game as long as you’d like without running out of cards or losing interest.. sooooo, more Oreos to eat! Game recommendation: The Resistance. This is a fun card game that my sister loves. It is an interesting experience.. Every single round your allegiances change, and different people are spying and lying, or desperately trying to prove that they’re loyal to the team… In just a few short rounds, your opinion of your friends/relatives can sway from affection, to OMG I HATE THESE LYING BETRAYING JERKS, and back to affection and high-fives! 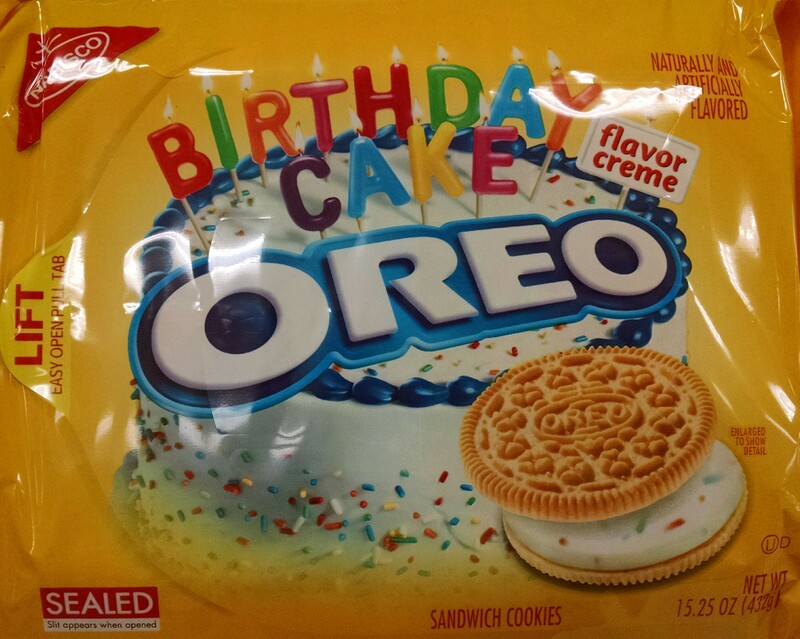 Birthday Cake Oreos: Another flavor that seems like an obvious great idea. And it was.. I definitely enjoyed these and ate quite a few. Cake flavor + chocolate = win. The sprinkles are pretty too! Game recommendation: Gubs. This awesome little game is a long-time favorite among our geeky friends, one of whom actually knows the game’s creators. It’s cute and fun, yet still gives plenty of delicious opportunities to crushingly disappoint your friends by stealing all of their stuff in one swoop.. I’m sure plenty of birthday get-togethers go that direction too! Marshmallow Crispy Oreos: This was a surprise favorite. The concept seemed really odd, but the actual product was delicious. The filling is a deliciously super-sweet marshmallowy treat, with little crispy bits. It didn’t really taste that much like a Rice Krispie treat, but the sweetness with the golden Oreo cookie was very good. Definitely one of the best, and I have several relatives who agree with me on that. Game recommendation: Betrayal at House on the Hill. Another all-time favorite of our group of friends.. And it tends to last for a long time, so plenty of time to eat all those delicious Oreos! 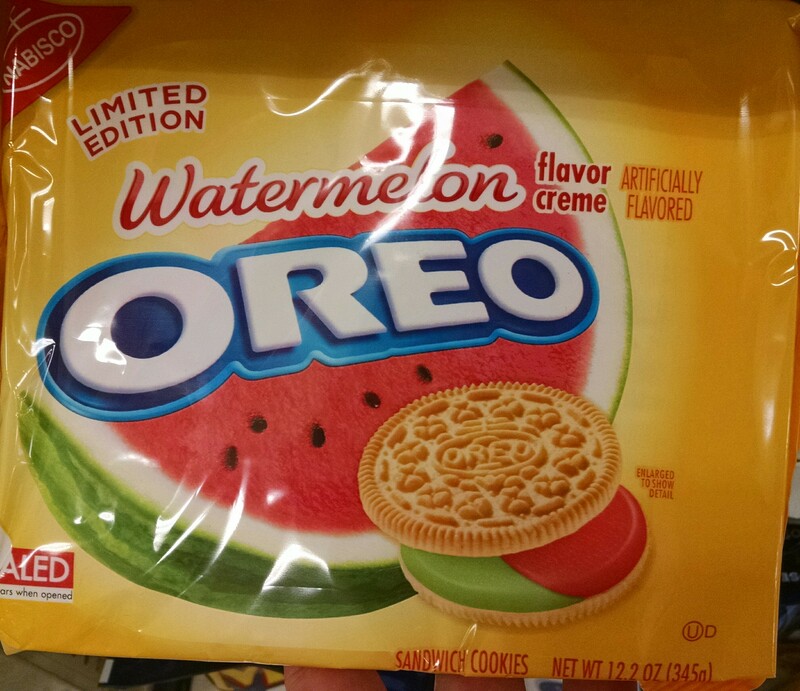 Watermelon Oreos: Um.. What were they thinking? Really? Weirdest idea ever. And strange off-putting colors. The cookie’s flavor wasn’t much better, it’s just simply very odd all around. Game recommendation: Fluxx. This wacky game can go off in a million odd directions, changing constantly, always keeping you on your toes. Any version would work, but my favorite variation is the sci-fi themed Star Fluxx. 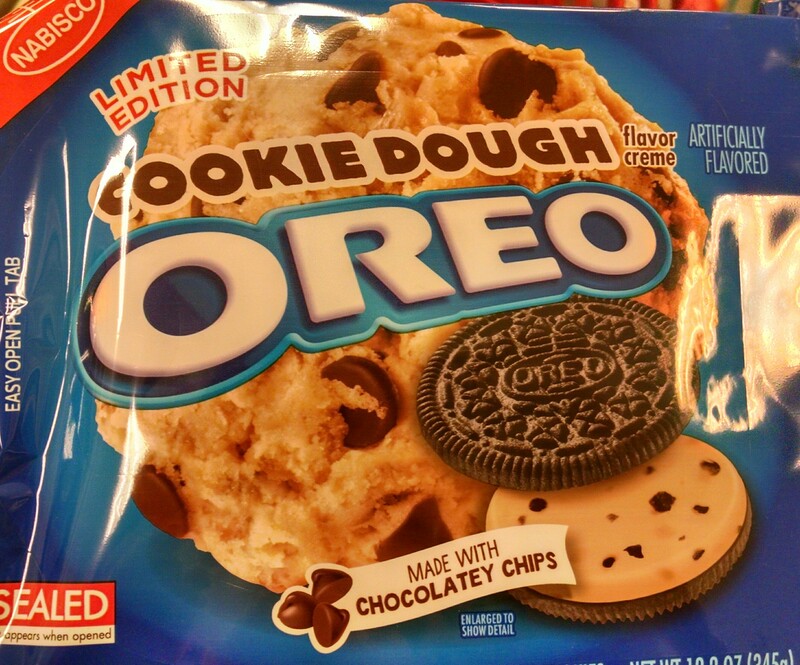 Cookie Dough Oreos: This sounded delicious. And it actually was.. though it didn’t taste quite like I expected. The filling didn’t taste like your standard cookie dough; rather, it had the strong buttery-brown sugary flavor of the first few ingredients of a cookie dough batch. This was a good choice; it blended well with the chocolate Oreo around it, giving the entire cookie a nice balanced flavor. Solid. Game recommendation: Star Trek Settlers of Catan. Settlers of Catan is a standard fun crowd-pleaser, and the Star Trek version mixes it up a bit with some new powerful character cards. Love it. Banana Split Creme Oreos: These sounded like they’d be okay, but I did not like them at all. They had a very strong fake-banana flavor that permeated and distracted from everything else. Game recommendation: Bananagrams. What would go better with fake banana flavor than a game that’s stored entirely inside a fake banana?! Root Beer Float Oreos: Another weird one! These actually weren’t as terrible as I was afraid they’d be. The root beer flavor wasn’t too strong, so the vanilla creme and golden Oreo cookies mellowed it out sufficiently. However, these are not ones I can imagine eating regularly; they are too much of a novelty item. Game recommendation: Epic Spell Wars of the Battle Wizards: Duel at Mt. Skullsfyre. A very weird game, but a super fun and silly one nonetheless. Awesome for blasting your friends to death. 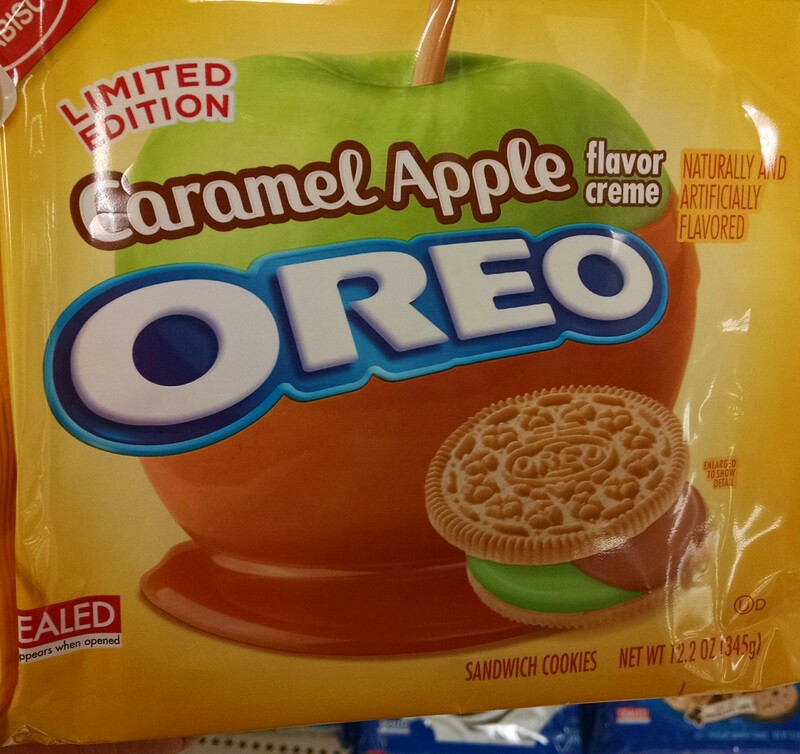 Caramel Apple Oreos: This flavor was my most recent acquisition. I thought it looked pretty good, and I wasn’t disappointed. The caramel portion of the filling tasted EXACTLY like the caramel you’d put on an apple, and the apple flavor was quite good too.. It all blended to make a very convincing caramel apple taste. The tartness of the apple flavor went very well with the sweet golden Oreo surrounding it. Game recommendation: Apples to Apples. Wholesome and solid, just like these Oreos.